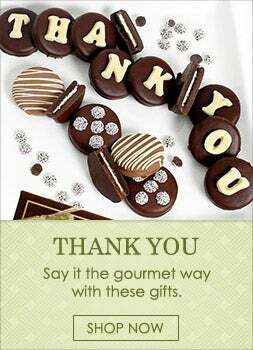 For over a decade, GourmetGiftBaskets.com has aimed to stand apart from the competition. 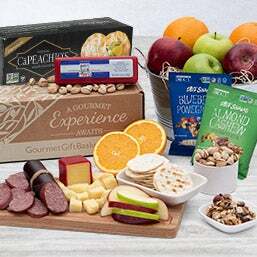 From a seamless order experience, to an unparalleled selection of gift baskets, our #1 goal is to wow our customers. 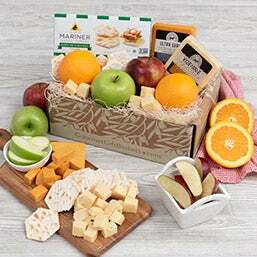 Watch this short video to learn more about how our gift baskets are developed. The happiest holidays start with holiday gifts from us. 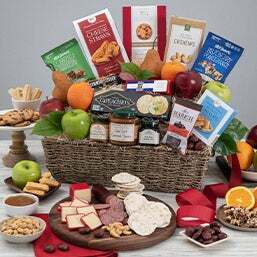 That’s because our products are created using only gourmet ingredients that are arranged by hand, yielding beautiful gift baskets that are as pleasing to the eye as they are to the palate! Easter Gifts – Our Pre Made Easter Baskets are perfect Easter Baskets for Kids and Adults. Ranging from Carrot Cake to arrangements of classic Easter treats, our collection of cheerful Easter gifts are perfect for everyone! 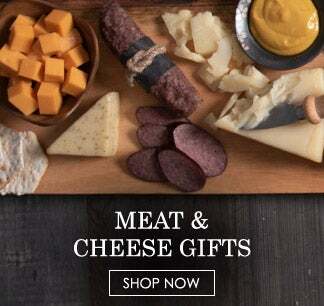 Christmas Gifts – Filled with decadent foods, like artisan chocolates and fine wines, our festive holiday gifts make it easier than ever to eat, drink, and be merry! 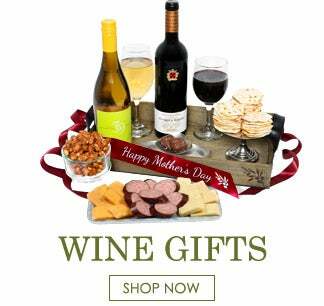 Mother's Day Gifts – Boasting things she’ll love, like coveted spa products and decadent gourmet chocolates, our collection of beautiful gifts are guaranteed to make this Mother’s Day special. 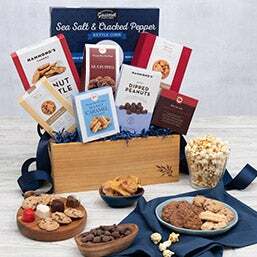 Father's Day Gifts – Making Father’s Day memorable is easy to do with our amazing gift baskets! Each one boasts delectable snacks and delicious treats Dad will find impossible to resist. 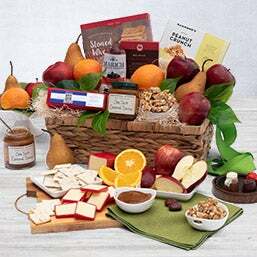 Every occasion has a reason to have a gift basket delivery made to your recipients. 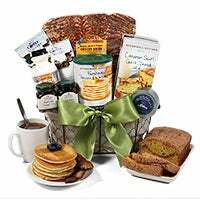 Our gift basket selection is created with all of those special occasions in mind. 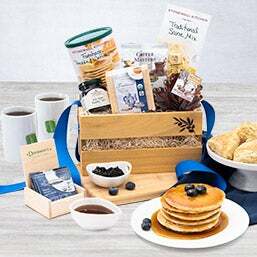 From Birthday Gifts to Thank You Gift Baskets, we've got a gift that you'll be proud to send! 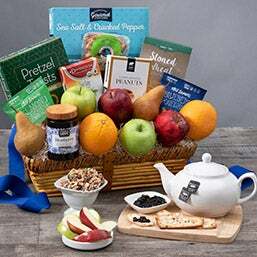 Birthday Gift Baskets – Wishing them many more is a piece of cake! 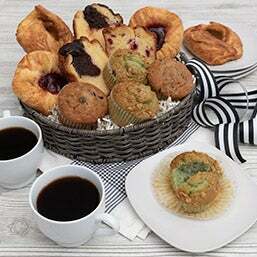 With baked goods and the supplies for cocktails, our gourmet baskets will make their celebration special, no matter what age they’re turning. 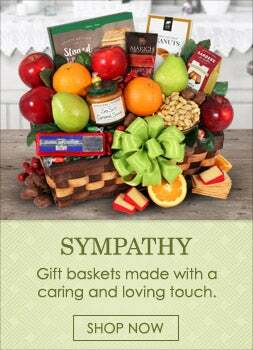 Sympathy Gift Baskets – When words alone won’t do, we’re here to help. Each of our sympathy gifts is designed by experts, allowing you to simply and elegantly express your condolences. 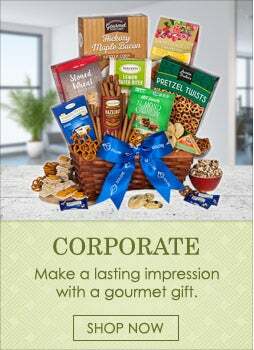 Corporate Gifts– Perfect for clients as well as coworkers, our corporate gifts are designed by experts to make a lasting impression. Beer Gifts – Ranging from the tastiest microbrews to the most well-known in the world, the beers in our baskets offer the perfect taste for any celebration! 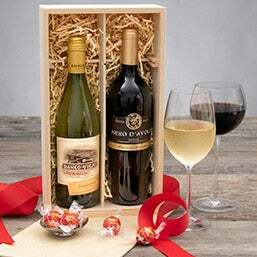 Wine Gift Baskets – No matter your knowledge of reds and whites, we’ll make you look like an aficionado. 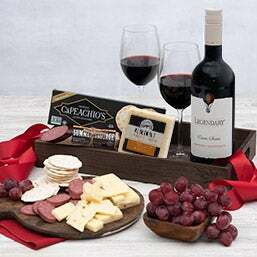 Our wines come from some of the most notable vineyards in the world and are expertly paired with gourmet foods. 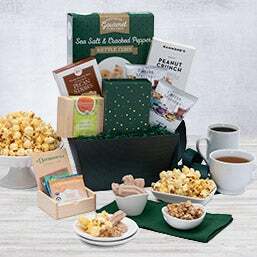 Popcorn Gifts – A stellar choice for just about any occasion, our gourmet popcorn is handcrafted using only the highest quality ingredients. 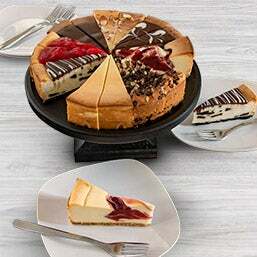 Cheesecake Delivered – We offer over 30 uniquely delicious cheesecake flavors and each one is created using the finest ingredients, like fresh fruits, artisan chocolates, and premium nuts. Chocolate Covered Gifts – Dipped by hand into baths of exquisitely smooth Belgian chocolate, these elegant treats are the perfect holiday gifts or any gathering. Specially designed with favorite treats, games, and snacks, you can send a care package today and send the T.L.C. of home wherever it’s needed. 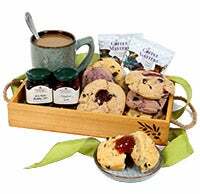 Spa Gift Baskets – Send the spa to them! With luxurious bath products designed to relax and rejuvenate, our pampering baskets always appreciated. 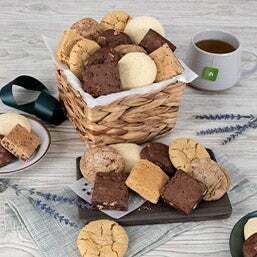 Cookie Cakes– Our delicious cookie cakes are a delcious way to have a coookie gift delivered right to their door. Baked fresh with fun designs, these ccookie cakes are sure to impress. Sometimes it's easier to shop by recipient for the gift basket you're looking to have delivered. 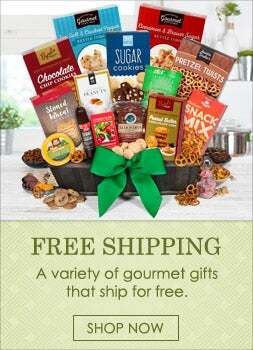 We have broken down each of the recipients on your list and created gift baskets specific to their desires. Gifts for Men – Send a Beer Gift, Man Crate, or a bold Popcorn Flavor. Either way, we've got a great lineup of Gifts for Men. 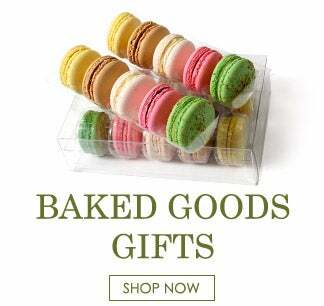 Gifts for Women– From Spa Baskets to decadent Baked Goods gifts, we have many gifts to choose from for the women on your list. Gifts for Kids – Gifts for Kids can be hard to find. What do they like and will they eat that are always questions. We've done the research and have the perfect gift baskets and gifts for kids.